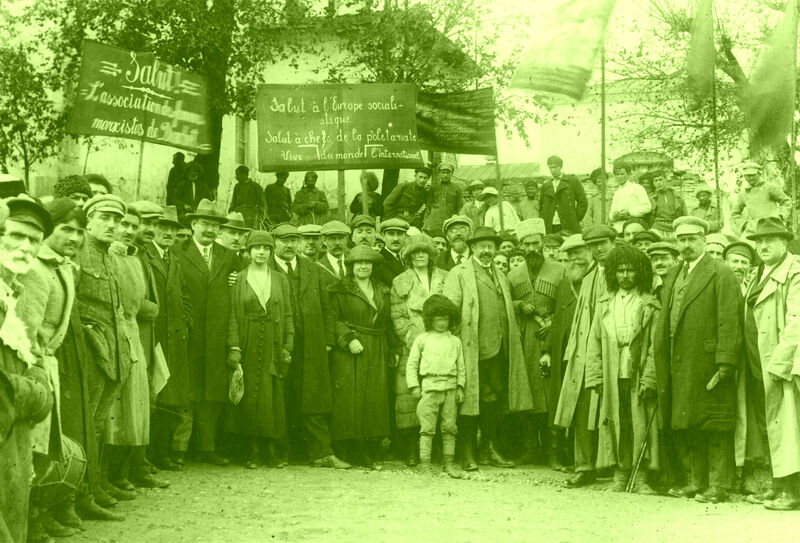 100 Years On: What's Left of Georgian Social Democracy? Prices checked on 19 October 2017. 30 November 2018: Eric Lee spoke at Tbilisi State University on the subject of A Tale of Two Revolutions. 20 November 2018: Eric Lee's article "100 Years On, What's Left Of Georgian Social Democracy?" appeared on the website of The Foreign Policy Centre. 1 November 2018: Eric Lee spoke at two events in London - Georgian Studies Day at the University of Westminster with the theme 'Georgian Independence 1918-1921: Then and Now' and later at SOAS - Centre of Contemporary Central Asia and the Caucasus, on the subject of Georgia's experiment in democratic socialism. 11 October 2018: Eric Lee spoke on a panel at the Frankfurt Book Fair, together with his publishers in Georgia and the UK. The Guest of Honour at this year's fair is Georgia. There are photos of the event and a desciption - in Georgian - here. 26 July 2018: Eric Lee spoke to young activists and leaders from Armenia, Azerbaijan and Georgia about the legacy of the first republics in those countries. Read the full text here. 11 July 2018: Eric Lee's article Georgia's experiment with democratic socialism was published by Rudaw, a Kurdish news website. 5 July 2018: Eric Lee's article The Second International – Georgia's "useless" ally or a European power? was published on the civil.de website. Civil.ge is a project run by the United Nations Association of Georgia. 25-30 June 2018: Eric Lee spoke at an international conference in Tbilisi to mark 100 years since the Georgian declaration of independence in May 1918. 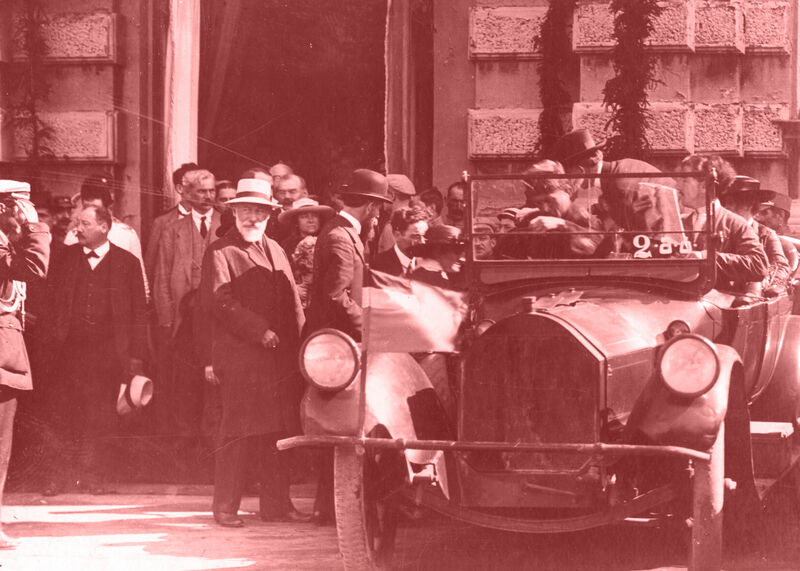 His initial talk on the Socialist delegation to Georgia in 1920 is online here. 13 June 2018: Eric Lee spoke at Housman's Bookshop in London about the Georgian experiment. One participant tweets: "Was at this earlier this evening. Absolutely compelling story well told. Fair to say everyone was enthralled. 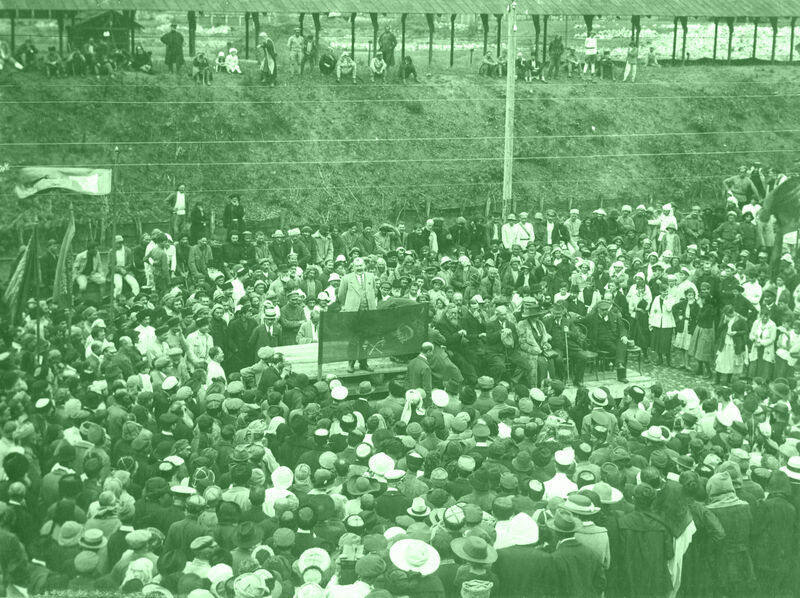 ‘The Experiment: Georgia's Forgotten Revolution 1918-1921’. Housmans sold out of his book within minutes. @ZedBooks has got a winner here." 25 May 2018: Eric and Peter Tatchell had an article published in the Huffington Post -- "In the streets of Tbilisi, Georgians must make a choice". 19 May 2018: Eric Lee spoke at an event at the home of Sir Oliver Wardrop, the first British High Commissioner to the Caucasus, during the period of Georgian independence. Here is full text of his speech. 5 May 2018: Eric Lee speaks on a panel at a showing of an hour long film produced by the National Archives in Tbilisi, and consisting of footage from the first Georgian republic in 1918-1921. The film is shown as part of the London Georgian Film Festival, dedicated this year to the 100th anniversary of Georgian independence. 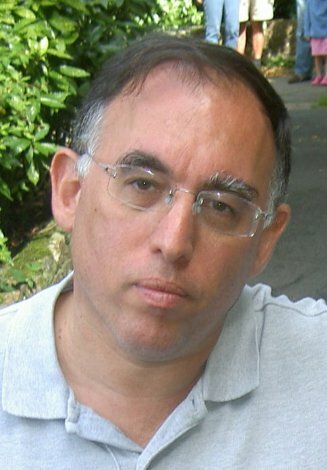 1 May 2018: Eric Lee speaks at a Henry Jackson Society event in London, on the subject of lessons of the first Georgian republic. 26 April 2018: Eric Lee speaks about the first Georgian republic at an event at the bookshop at Ilia State University in Tbilisi. This is preceded by an hour long radio interview. 25 April 2018: The book is launched in Georgian, at the Museum of the Soviet Occupation, part of the National Museum of Georgia, in Tbilisi. The Experiment is now available in three languages -- English, Esperanto and Georgian. 24 April 2018: Eric Lee is interviewed in Tbilisi by two Georgian national television stations -- Imedi TV and Rustavi2. 9 March 2018: Sean's Russian Blog posts a 40 minute long interview with Eric Lee about the first Georgian republic. 6 March 2018: Book launch held in the Houses of Parliament in London, organised by the Georgian Embassy in the UK and the All-Party Parliamentary Group on Georgia. Here is the account of the event in Georgia Today. 20 February 2018: Britain's venerable Fabian Society, two of whose leaders visited democratic socialist Georgia, has just published Eric Lee's article on "the most perfect socialism in Europe". 19 February 2018: You can order copies of the Esperanto edition of The Experiment in many countries - see here - scroll to bottom of the page. We're currently showing 16 online bookstores where you can order the book. 30 January 2018: The Esperanto language edition of the book - the first translation into a foreign language - is due to appear later this week. The publisher is MAS. Details on how to order the book coming soon. 11 January 2017: Zed Books is selling the e-book version for 80% off - just £2.20 - for the next 8 days. Details here. 28 December 2017: Eric Lee's article on the legacy of the Georgian Democratic Republic appears in EuropeNow. 3 November 2017: Dr Samantha Lomb of the The New Books Network interviewed Eric Lee for 48 minutes about the book. 22 October 2017: The New York Times Book Review reviews the book. 13 October 2017: Eric Lee is interviewed for 30 minutes by Ian Williams on the Catskill Review of Books radio show. 18 September 2017: Historia magazine publishes author Eric Lee's account of how and why he wrote the book. 15 September 2017: Official date of publication. 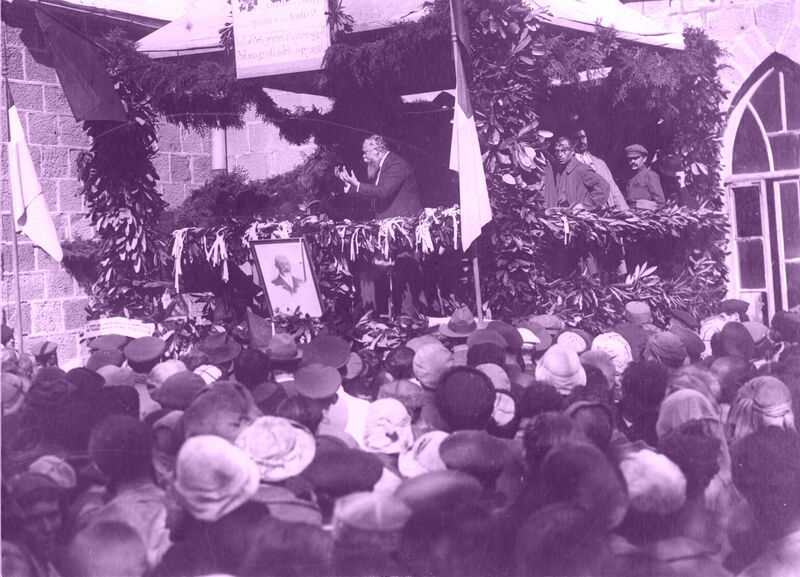 Author Eric Lee addresses the congress of the Georgian Trade Union Confederation, Tbilisi. You can read his talk here. 14 September 2017: Launch party in Tbilisi at Prospero's Books. 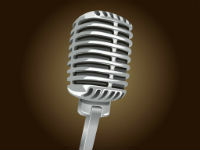 Read author Eric Lee's talk here. 4 September 2017: Zed Books publishes this blog by author Eric Lee, introducing the subject of the first Georgian republic. 3 September 2017: The Bookseller, the British weekly magazine for bookshops and the publishing industry, has named THE EXPERIMENT as one of the best book cover designs for September. No upcoming events scheduled. Want Eric Lee to speak to your school or organisation about Georgia? Contact him at ericlee@labourstart.org. For many, the Russian revolution of 1917 was a symbol of hope, and proof that that another world was indeed possible. But Soviet authoritarianism and the horrors of the gulags have since led to the revolution becoming synonymous with oppression, forever tainting socialism in the eyes of its critics. 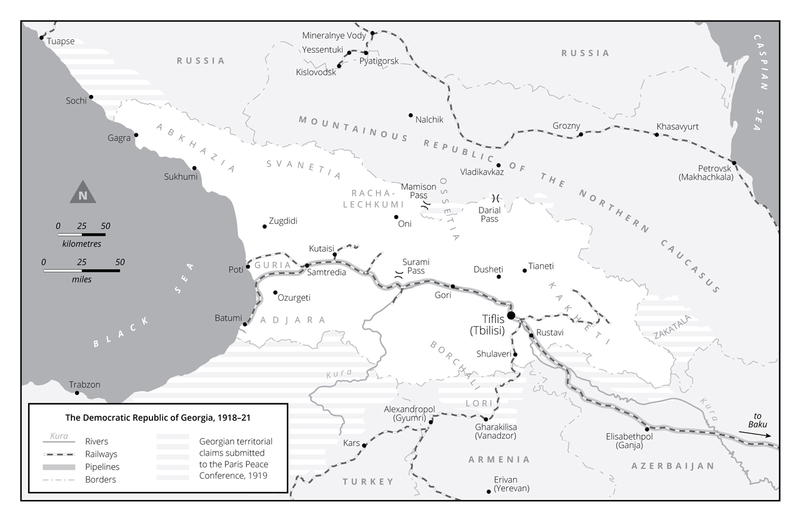 The experience of Georgia, however, which declared its independence from Russia in 1918, shows there was another way. In this riveting book, historian Eric Lee explores the little-known story of the country's experiment in democratic socialism, detailing the turbulent events of this forgotten chapter in revolutionary history. Along the way, we are introduced to a remarkable cast of characters - among them the men and women who strove for a vision of socialism that featured universal suffrage, a people's militia in place of a standing army, and a civil society grounded in trade unions and cooperatives. Though the Georgian Democratic Republic lasted for just three years before it was brutally crushed on the orders of Stalin, it was able to offer, however briefly, a glimpse of a more humane alternative to the Communist nightmare that was to come. Post - Suite 504, 394 Muswell Hill Broadway, London N10 1DJ, U.K.
"Eric Lee is a journalist as well as a historian and The Experiment benefits from his crisp, clear prose. He is also a veteran of the labour movement and these two aspects allowed him to situate the experience of the Georgian Social Democratic Republic within its historical and geopolitical context and, perhaps most importantly, within socialist history and thought. He engages critically with his sources, drawing on a diverse group of writers including Leon Trotsky, Karl Kautsky, and future British Labour Prime Minister Ramsay MacDonald to tell the story of the Georgian Republic. Most importantly, when locating Zhordania and his Georgian Mensheviks within the canon of Marxist theory and the plurality of contemporaneous Marxist opinion, Lee makes socialisttheory accessible to his readers. He introduces a ‘Who’s Who’ of early twentieth-century socialism, making sure to explain briefly to his readers the identity of these people and their significance to socialist thought, while never losing sight of his main narrative of Georgian socialist and democratic development. 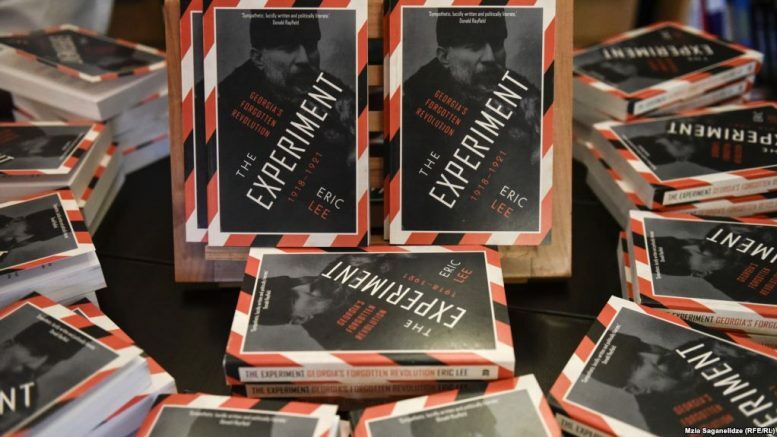 Lee’s accessible style and his comprehensive look at a largely unstudied subject makes The Experiment a must-read for casual history buffs, students and serious scholars alike." Review by Dr Samantha Lomb, Assistant Professor, Department of Foreign Language Teaching Methodologies, Vyatka State University, Russia in the journal Europe-Asia Studies. "Eric Lee, a labor activist and journalist in the United Kingdom, has produced a lively text on a neglected but fascinating period in the history of socialism, and in the history of revolutions. ... The book will attract a lot of interest among Europeans who are thinking about alternatives to authoritarian socialism, or to neo-liberalism. The author has performed an important service by throwing light on a fascinating period in Georgian, European, and world history. The Georgian Democratic Republic needs far more attention in the historiography of European socialism and European twentieth-century history than it has received so far. Eric Lee has given us a good start." Review by Dr Stephen Jones, Mount Holyoke College, in Russian Review. "Despite its name, the Russian Revolution was not just a Russian phenomenon. Journalist and historian Eric Lee tells one of these non-Russian stories in his Georgia's Forgotten Revolution ... Lee's book describes the major figures of this beguiling political experiment, and how their politics was an alternative to the Bolshevik authoritarianism emerging in neighbouring Russia." 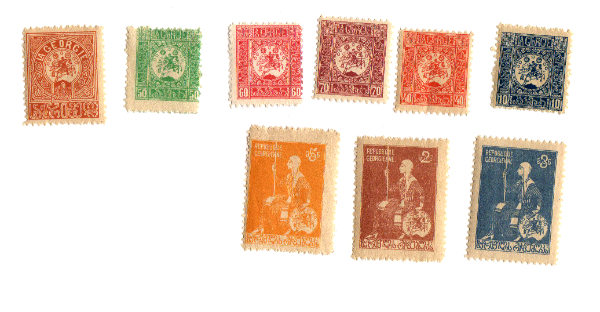 - Howard Amos Read the full review in The Calvert Journal, which named The Experiment as one of the "best centennial books on 1917 from this year you should read"
Above - a selection of postage stamps from the Democratic Republic of Georgia. Georgia: A Social-Democratic Peasant Republic – Impressions And Observations by Karl Kautsky (1921). 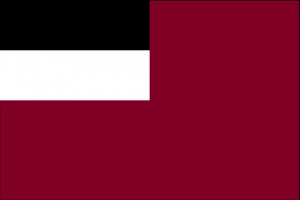 Between Red and White: A Study of Some Fundamental Questions of Revolution, With Particular Reference to Georgia by Leon Trotsky. Another world was possible - for workers Georgia's trade unions invited me to speak in Tbilisi -- this is what I had to say. November 1916. 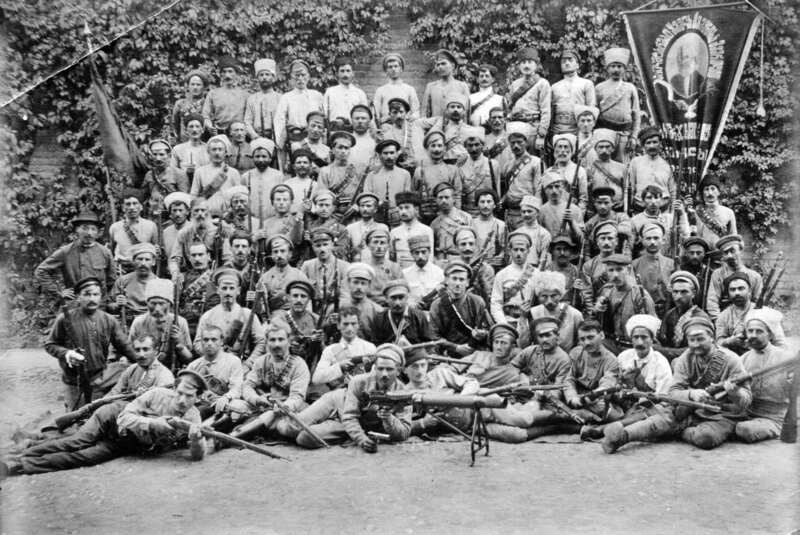 Мир для трудящихся мог быть другим: грузинский эксперимент 1918–1921 гг. Menshevism in Power: The foreign and defence policy of the Georgian Democratic Republic Chapter for a forthcoming collection of essays on the socialist movement, peace and war - details soon. Georgia on My Mind - An article published in 2010 in the German weekly newspaper Jungle World [German language].